Use the form below to inquire about Plantation Homestay At Nalkeri . Use the form below to reserve for Plantation Homestay At Nalkeri . There are three spacious bedrooms all having queen size beds. At an altitude of 3,000 feet, you will be transported into heavenly tranquillity with mist, aroma of coffee, chirps of birds, and lush greenery for a company. The exterior of this Plantation Homestay at Nalkeri resembles a typical Coorg home. The rooms here resonate a complete homely aura. Right from furnishings to upholstery, every bit of this accommodation fills the heart with amicable comfort. Three immaculately-kept rooms are well-appointed and can easily accommodate an entire joint family making it the best bet to spend quality time with your loved ones. The two sitting rooms and a dining area add to the homely atmosphere. The spacious outdoor area with well-manicured lawns is arguably the best spot for picnics and camping. Rocky trails, narrow streams, and hanging bridges inside the premises make for many hangouts in the lap of nature where one can spend hours together, soaking in the freshness, beauty, and purity of the stunning surroundings. Guided coffee tours through the plantation are more refreshing than a cup of coffee itself. Nature walks through the neighborhood are surreal and rejuvenate the mind of stress from your everyday routine. This Plantation Homestay at Nalkeri offers its guests the freedom to choose what they want to experience through various packages. 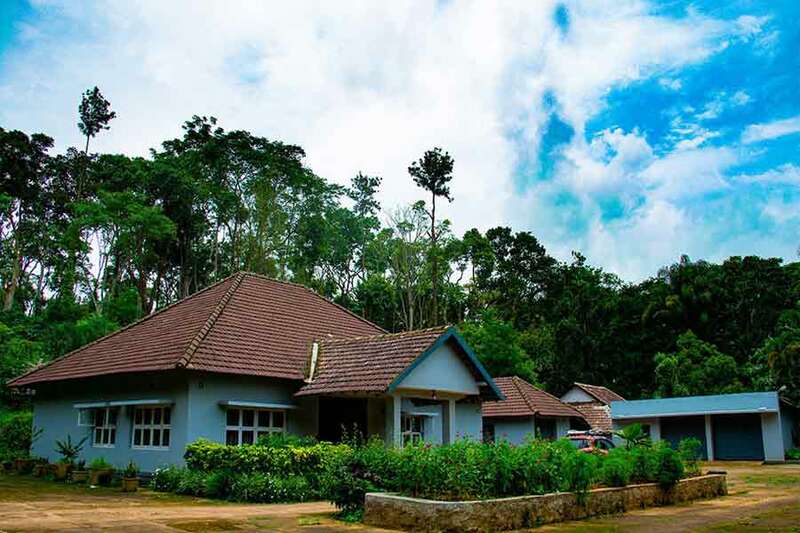 Trekking trips, safaris to Nagarhole and Wayanad Wildlife sanctuaries, temple trails, bird watching trips, angling, tourist tours, plantation and sustainable farming, picnic, and partying are some of the customized experiences the Homestay has in store. Wildlife safaris, bird watching, and river rafting are activities quintessential to the locale. Indoor and outdoor games facilities at the bungalow will lend an interesting twist to bonding moments. The inflatable swimming pool on the property is irresistible during summer. Food served at the bungalow includes vegetarian as well as non-vegetarian delicacies of Kerala and Coorg. The hospitality is commendable and every little aspect of this Plantation Bungalow will create cherished memories for you to take home. Tariff includes breakfast and dinner. Activities not mentioned in inclusions are charged extra. Children below 6 years are not charged. Children kids 6-12 years are charged half price. Get additional discounts when you book the full house. No discounts from December 10 to January 15, 2019. Full refund for cancellation 14 days prior to date of check-in. 50% refund for cancellation 7 days prior to date of check-in. No refund for cancellation during the week prior to check-in. The meandering walks through the mesmerizing coffee plantation are enlightening as well as refreshing. Nature walks leave you enriched with the experience of witnessing innumerable verities of flora and fauna. Small streams and rocky edges juxtaposed against verdant landscape add to the rugged beauty. A plethora of birds streaks the area with charming hues and melodies, making the spot a birdwatchers’ delight. Experience wildlife from close quarters at the Nagarhole or Wayanad reserves forests through jungle safari. Being at the heart of the Nilgiri Biosphere, this part of the world is abundant in Asiatic elephants, tigers, leopard, deer, bear, and many other wild species. Trekking and river rafting is for the daredevils who wish to challenge it all. Gorgeous Irupu Falls, Golden Monastery of the Tibetans, sacred Talacauvery, Bagamandala, Gaddige, and Iguthappa Temple are other popular attractions near the Homestay. Nestled amidst the lush green coffee plantation, this beautiful contemporary bungalow is the perfect retreat; just the place to relax and feel in perfect sync with nature and discover yourself. Wake up to the melodious chirping of the birds - sights and sounds that will transport you to a tranquil world. An added bonus is that this place also welcomes your pets. This Bungalow can be easily called a home away from home. Enjoy Coorg cuisine alongside various others with the excellent food being rustled up by an experienced cook. Enjoy the steaming hot cups of filter coffee which are freshly brewed. A lovely collection of books, board games, and a whole lot of outdoor activities like nature walks, guided tours of the coffee estate, and bonfire on request will keep you busy. And most important is the warm hospitality of the hosts. What more could one ask for!